Over 50 clergy—a larger group of participants than initially expected—from parishes as far as Oregon and as close as Olyphant, PA arrived at Saint Tikhon’s Seminary here on Tuesday evening, June 18, 2013, to attend in the school’s Continuing Education Symposium. The symposium, which ran through Thursday, June 20, featured speakers from the seminary and the monastery communities. The Saint Tikhon’s Community was pleased to provide this symposium in cooperation with the Orthodox Church in America’s Department of Continuing Education. 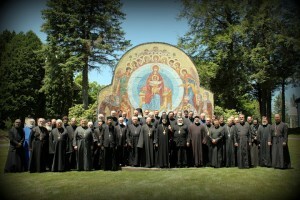 His Grace, Bishop Michael of New York and seminary Rector, thanked Igumen Sergius for his contribution to the offering of lecturers and the hospitality of the monastery brotherhood in providing the trapeza for the event and preparing the seminary grounds for the arrival of the symposium participants. Plans are underway to make each of the lectures available on-line so that those unable to attend will able to fulfill their yearly Continuing Education Credits. Materials for the on-line offering are expected to be completed by the beginning of the 2013-14 Academic Year. Advanced reservations may be made at info@stots.edu. A photo gallery of the symposium is available here.